Postcard Advent Calendar, December 24: Sing A Song for Christmas! A Merry Christmas on this eleventh day of my Minor Postcard Advent Calendar! I am so pleased to find among my collection a fine example of a glittered embossed postcard by P. Sander Company. Oh, how I wish I knew the ins and outs of scanning to capture three dimensions, for the publishers of this era worked hard to enhance their cards, simply and cheaply, with embossing–raised areas of the painting that create depth! 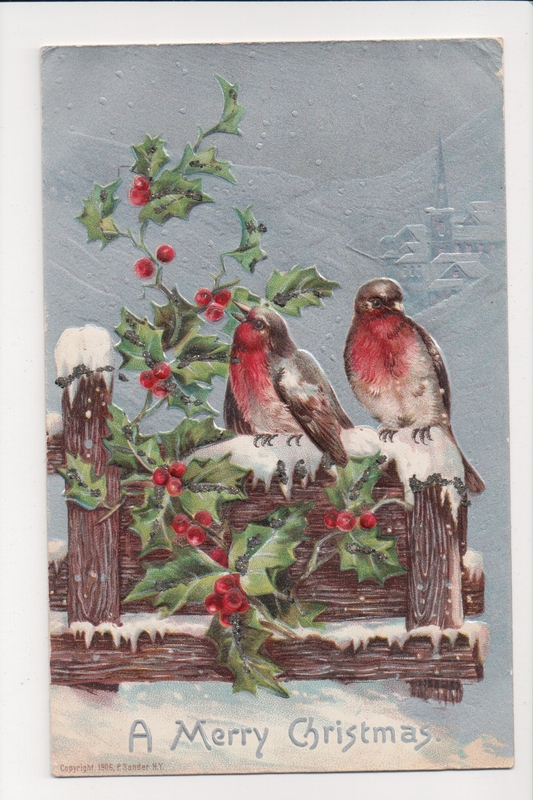 In this 1906 card the red-breasted songsters are heavily embossed atop a snow-covered fence that is less heavily embossed, quickly drawing your eye to the artist’s main subject. The holly and snow are not only embossed but glittered, giving the impression that the sun may be peaking out between snow bearing clouds. In the silver embossed background, a riverside town sits in the muffled, snowy silence. Such a beautiful card! A hand delivered Merry Christmas to four year old Donald Minor from May M.
Next Article Postcard Advent Calendar: Merry Christmas!